As you can tell from the title of this post, this tutorial is going to be on dynamic room creation. So, with dynamic room creation, you are able to create new rooms straight from the client, without even restarting the server, unlike adding rooms from the config.xml file. One disadvantage of creating rooms from the client is that the room is not persistant. To make the room persistant, you would have to use an extension, which isn't all on the client, more on the server than the client. Anyway, let's begin with this short and fast tutorial. Now, that's all for the frame coding. So now we have to figure out a way to call the function. So, as you can see from our function, we need three parameters. 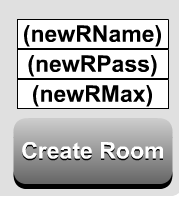 So what I did was create three input text boxes and give them an instance name of newRName, newRPass, and newRMax. So, that's basically all you needed to add. Once you test your movie, you should see that it works! NOTE 1: If the new room is empty, it might delete itself (I'm not sure if this is the correct way to say it), but I do know that if no one is in the room and you logout and login again to the avatarChat example file, the room is deleted by itself. NOTE 2: When the smartfox.createRoom() command is called, I believe it fires the smartfox.onRoomAdded handler. YOU GUYS ROCK KEEP IT UP!! !